Lantra Falconry Award is now gone! 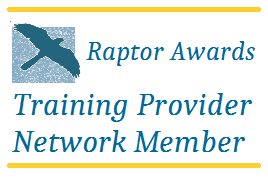 Raptor Awards is the new recognised qualification. Raptor Awards is an expert body serving the Bird of Prey Community. We specialise in the development of National and Occupational Standards for Bird of Prey keepers. Working with Professional Falconers, Raptor Veterinarians and others we devise and accredit training programmes and courses for all who wish to keep or work with Birds of Prey. The welfare of Birds of Prey is at the heart of everything we do. World of Owls is an approved member and training provider.